As one way to provide for continual nurturing, HOPE3 Ministries offers a weekly Bible Study. Bible Study begins each week with a meal at 6:30 PM to enjoy fellowship before diving into the Word. In 2017, the group was scheduled to complete a three year chronological read through the Bible. 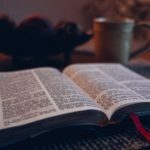 When New Testament readings picked up in April, the group decided to devote two years to the New Testament, instead of breezing through it in 8 months.A reading plan can be found here. Folks can join in at any time in the journey. If you’ve ever wanted to read through the Gospel and the Letters in chronological order, here is your opportunity. Joins us for the beloved stories of Christmas and Easter; Christ’s parables, the sermon on the mount; and the treasured verses of Corinthians and Romans: there is so much to (re)discover in the New Testament, and this spring is your opportunity to join the adventure. Attendance is not required. Join us one week or all, or just read along the schedule with the group. Do you remember Zacchaeus? Stephen? Andrew? Can you name the twelve Apostles? We are so excited to continue to explore the holy scriptures through reading, asking questions and respectfully conversing with each other.